This research is descriptive qualitative research with Marxist theory on social class and culture stratification as its basis of the theory. Looking at the primary data taken from the movie, it is proven how social class and culture stratification affects art status and marriage approval. Circus as art is considered lower class art because it is cheap and historically poor just like it is rejected in the movie. Marriage approval is also affected by social class on how different class cannot marry because they would be not considered as not family member anymore. Industrial revolution as the beginning of all social class affect many things until today as what is depicted in the movie. .______. Theory of Stratification . Retrieved from http://www.sparknotes.com/sociology/social-stratification-and-inequality/section4/page/2/ on July 11th 2018. Mattick, Paul. 2003. Art in Its Time : Theories and Practices of Modern Aesthetics. Mattouscheck, Niko. Imran Rasul. 2006. The Economics of The Marriage Contract: Theories and Evidence. Panchev, Stoyan. 2013. Defining and Measuring Middle Class in Bulgaria. Institue for Market Economics. SAPUTRO, Galih Yoga; SETIANINGSIH, Fauziah; AZIZAH, Kuni Maskurotal. WHEN CLASS DEFINES ART AND MARRIAGE APPROVAL: A MARXIST ANALYSIS OF THE GREATEST SHOWMAN. 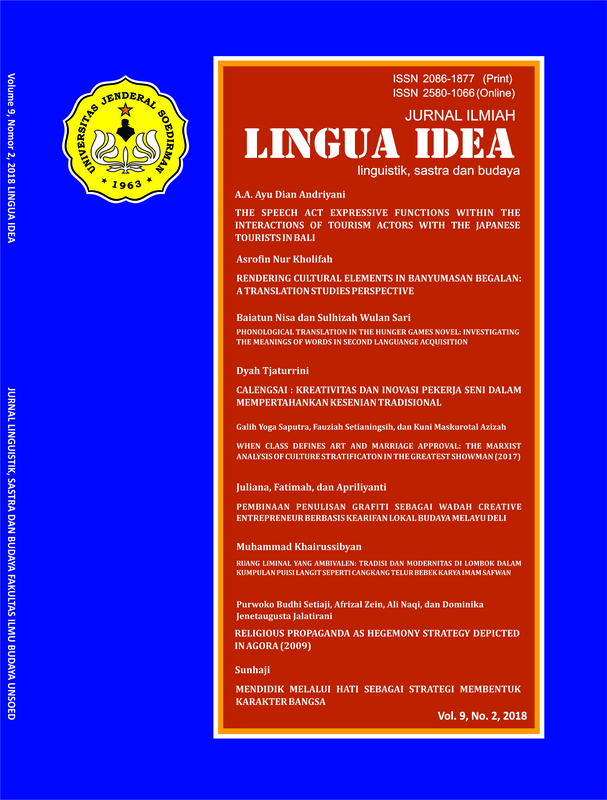 Jurnal Ilmiah Lingua Idea, [S.l. ], v. 9, n. 2, p. 121-128, oct. 2018. ISSN 2580-1066. Available at: <http://jos.unsoed.ac.id/index.php/jli/article/view/1251>. Date accessed: 21 apr. 2019. doi: https://doi.org/10.20884/1.jili.2018.9.2.1251.